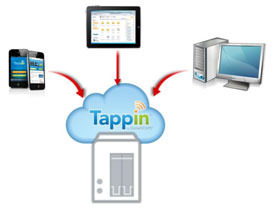 With TappIn by GlobalSCAPE, users can safely access data from most operating systems, platforms, and mobile devices. TappIn’s innovative secure cloud pathway eliminates the need to upload or synchronize data to the cloud, or pay for additional cloud storage. 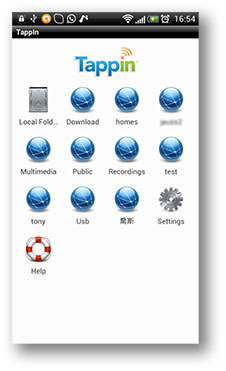 The QNAP Turbo NAS users can securely access and share files of any size with encryption using the TappIn service. To install the TappIn add-on on the QNAP Turbo NAS, login to the NAS web interface as an administrator. Go to “Applications Servers” > “QPKG Center” > “Available”. Scroll down until you see the TappIn QPKG and click “Install”. From the QPKG Center, click one of the links to connect to the TappIn management interface. 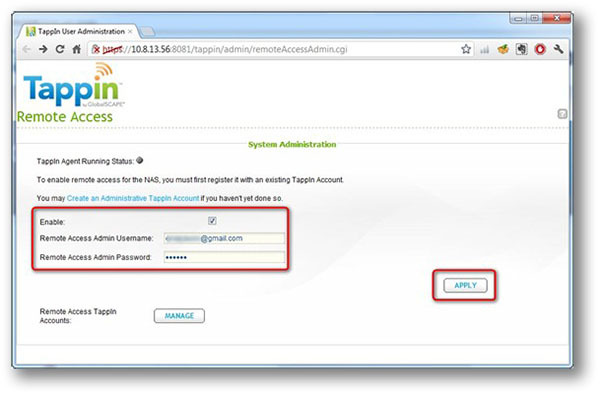 When prompted for password, use the NAS “admin” account and password to login. Start the TappIn service with a registered account. If do not have one, click “Create an Administrative TappIn Account”. 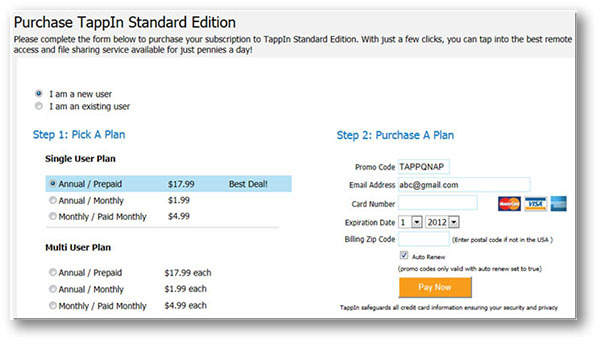 Enter your email address and click “Go” to create a free TappIn Account. To start the TappIn service on the QNAP NAS, go to “QPKG Center” and click one of the links to connect to the TappIn management interface. 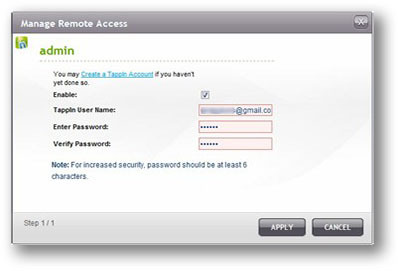 Select “Enable” and enter your user name and password for the TappIn service. Click “Apply”. 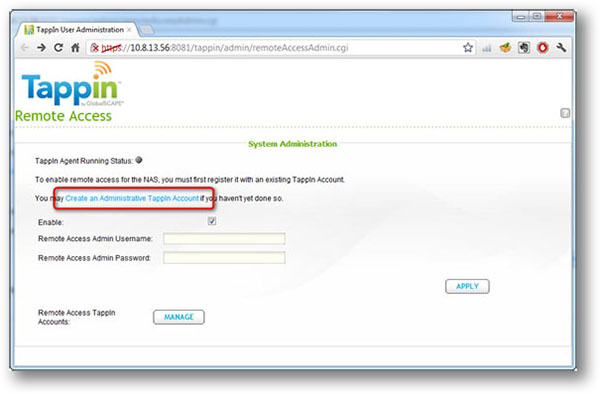 Upon successful remote access registration, click “Manage” and select the NAS user(s) who are allowed to use the remote access service of TappIn. 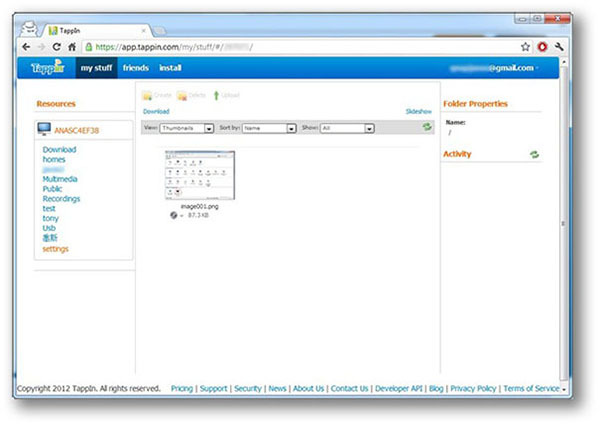 The NAS users are shown on the TappIn user administration page. Select a user, e.g. “admin”, to Link your TappIn account to. Click the TappIn icon next to the user “admin” in the “Action” column. Select “Enable”. Enter your email address and TappIn password. Click “Apply”. Now that remote access is enabled for your TappIn account, you can access the NAS data from anywhere via the Web or your mobile device. 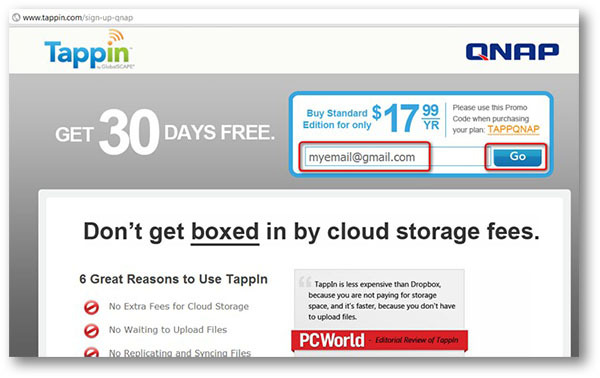 Go to TappIn website (http://www.tappin.com/) and login with your account. You can access and share the NAS data. 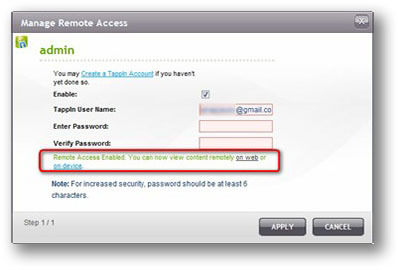 Only the network shares that the NAS user account is authorized to access will be shown. By default, all the shares are in Read only mode. You can click “Settings” on the TappIn web interface and change the shares property to Read/Write.